I’ve got one more fun raglan T-shirt customization idea for you this week. 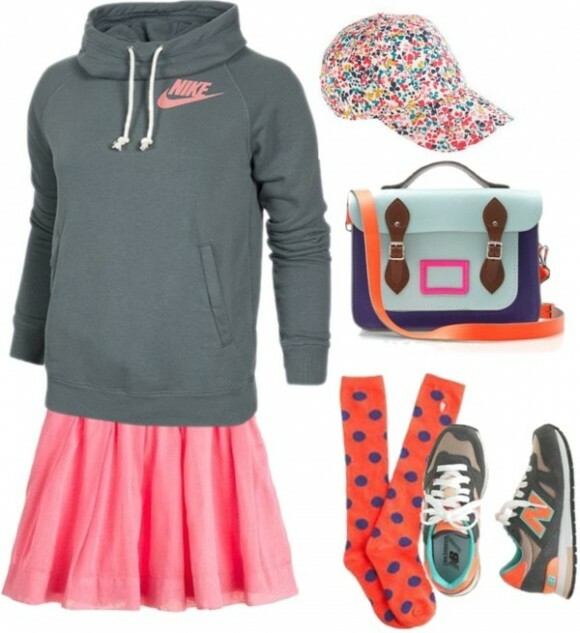 And next week I think we should do a few more customizing ideas with the leggings pattern, do you agree? How about a funnel-neck version with a kangaroo pocket? Kristin turned the raglan T-shirt into a cute sweatshirt for her son the other day, and I was thrilled to see it because we had been talking about a similar idea here at the studio. 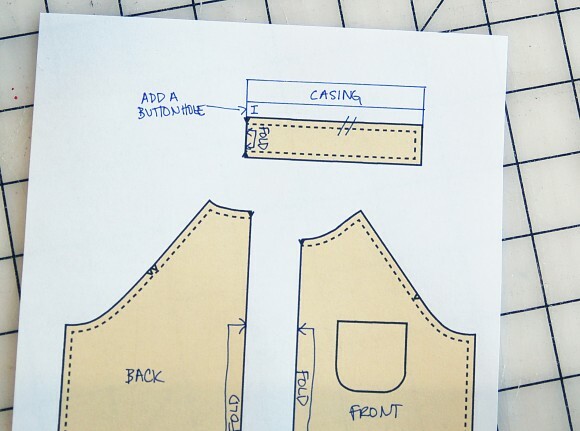 Like Kristin said, if you go up a size the raglan T-shirt pattern will be a little more roomy so it can be sewn from a fleece or French terry and be worn over other layers. Kirstin made her version like a classic sweatshirt with rib knit neck and cuffs. I love the V-neck rib that she added! 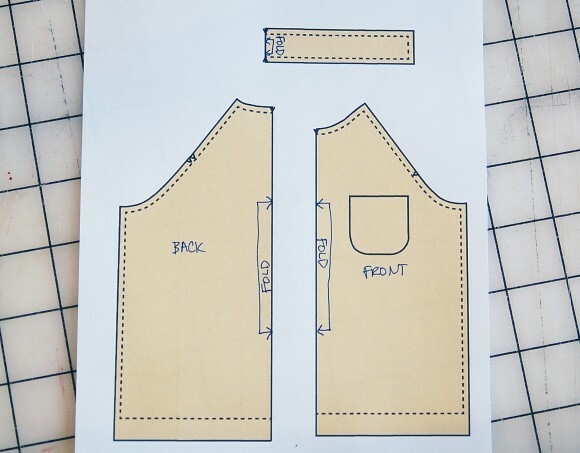 To sew it, you’ll stitch the short ends of the revised neckband/funnel neck piece together to make a tube. Then you’ll stitch buttonholes near the center front fold for the drawstring (if you want one) before folding over the casing portion and stitching it to form the casing itself. 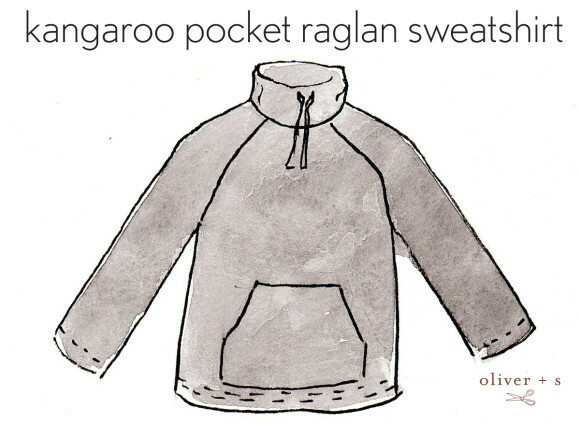 Then the funnel neck can be sewn to the neckline of the raglan sweatshirt in more or less the normal way, except that you’ll stitch the bottom edge of the neckband/funnel neck to the neckline instead of folding the neckband in half and stitching both edges the way the pattern instructions are written. That was a little vague. Did it make sense? 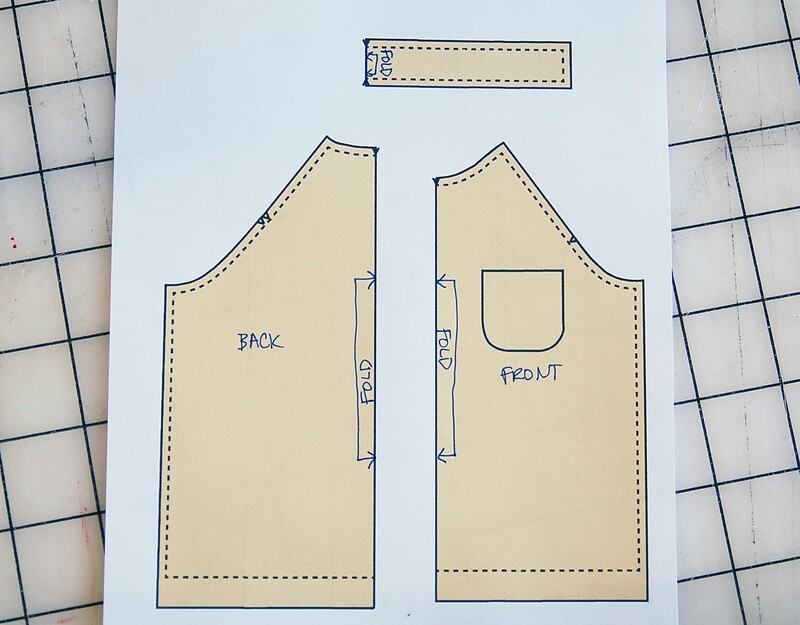 To make the kangaroo pocket, you’ll just decide the size of the finished pocket (I like to draw it directly onto the front pattern piece so I can get a sense for the scale), add seam allowances, finish the openings for the pocket (either fold and stitch or apply binding), and fold the seam allowances to the wrong side before pinning the pocket in place and stitching the top, bottom and sides below the openings. 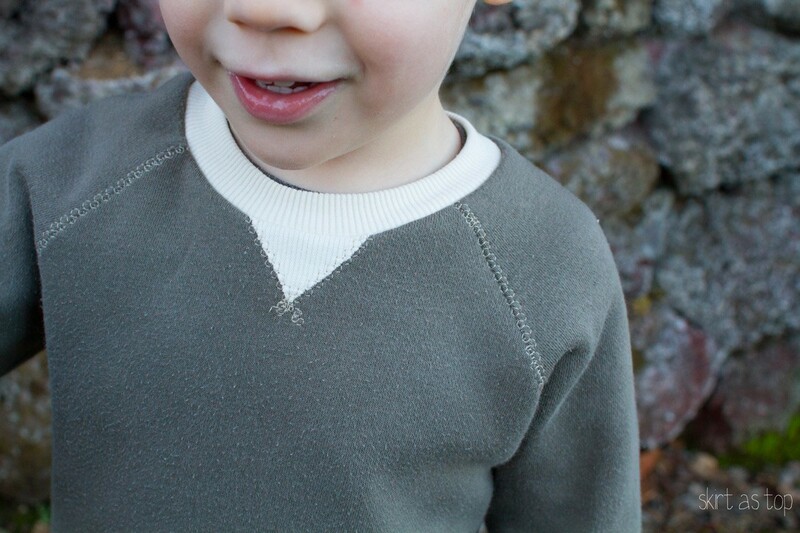 I’d suggest doing this before stitching the side seams of the sweatshirt–it will be much easier that way. Easy, right? After this week’s posts, do you see how such a basic pattern like the raglan T-shirt can offer lots of design opportunities? I hope you’ll show us what you make with the pattern. I can’t wait to see what you do with it! Have a wonderful Valentine’s Day and a great weekend. See you next week! This has been a very helpful series. Thanks for doing it, Liesl! I’ve been wanting to make my oldest daughter a funnel neck pullover for her to wear at track practice but wasn’t quite sure how to do the funnel neck. Very timely post! This is a great series and I would love to see more. Simple, adaptable patterns are my favorite clothes to sew. Love this one! As I was looking at the styling, I thought, hey, welt pockets. I can do those now! And I LOVE this funnel neck look. It would be so cute on my little gal, love it paired with a skirt! Thank you for this series! I’m really curious if you can do a tutorial on making it a button-front cardigan. I’ve been trying to wrap my head around it. Thanks!